Macbeth & Banquo meet the Weird Sisters. From the Holinshed Chronicles (see below), courtesy of Wikimedia Commons. I think we’ve all felt this way about sisters–or multiplication tables, for that matter–at one point or other, but these sisters are weird in more ways than one. See, weird is, well, a weird and wonderful example of how the meaning of a word can change. Old English had wyrd, a noun that meant “fate” or “destiny.” Pronounced something like the rounded, French u, this y would have made the word sound more like word than its descendant weird. The Oxford English Dictionary’s (OED) earliest attestation of wyrd is around 725, referring to “the Fates, three goddesses supposed to determine the course of human life.” The Three Witches are also known as the Weird Sisters because they were the Fate Sisters. Shakespeare is known to have drawn from Raphael Holinshed’s 1587 Chronicles of England, Scotland, and Ireland for the historical Macbeth, including “the weird sisters,” although the bard no doubt made them his own, too, with his conjury. This trope of three, fate-wielding women taps into a significant archetype in Western mythology. The Greeks had the Moirai, the Romans had the Parcae, and the Norse the Norns. Ludwig Berger’s 1882 Norns beneath the Yggdrasil tree, courtesy of Wikimedia Commons. This twisting and turning lives on in a great number of words. According to Jordan Shipley, *wer– assumed various forms that have become, in English, everything from virgin and vermiform to verse, vertebrate, and the huge family of words featuring –vert-/-version (e.g., convert). We shouldn’t forget English’s own clan of words featuring the suffix –ward and -wards (Old English: -weard). As Eric Partridge comments on –ward, “The endings connote a turning, a being turned, in the direction denoted by the precise element.” He lists: backward, downward, forward, homeward, inward, rearward, toward, upward, and, appropriately enough, wayward. Why is there toward and towards? The s in the latter form is leftover over from the genitive (possessive case) ending in Old English. So, this –ward would have been -weardes. Typically, the –ward words are adjectival, while the –wards adverbial, but this is not a strict distinction and one that is increasingly breaking down. 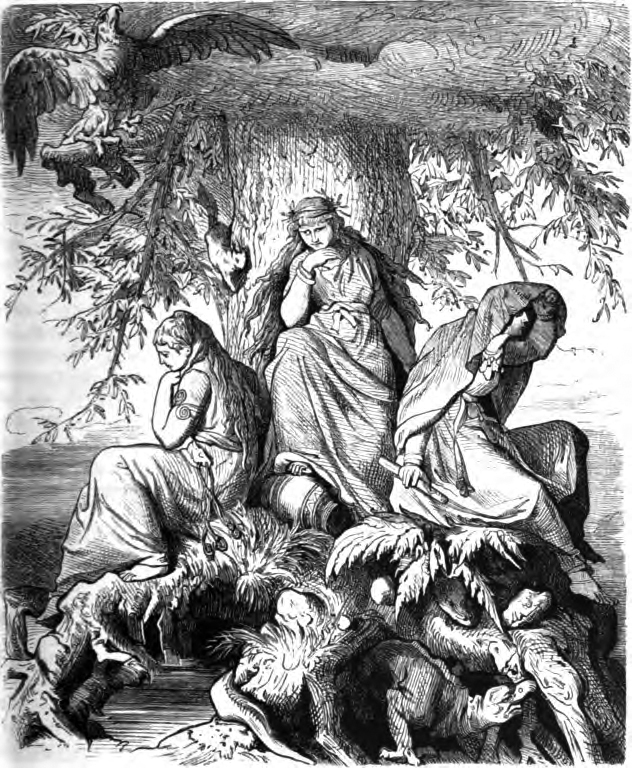 As we saw in the above discussion of the names of the Norns, Germanic languages ended up using *wer– and its metaphor of turning for a common verb for “to become.” In Old English, it the verb was weorthan, which survives as a kind of vestige in expressions like woe worth the day–woe becomes, befalls, or betides the day. Worth, as in “worth a lot of money,” from Old English weorþ, might also come from this root *wer-, perhaps on the grounds of value as the kind of equivalency implied by “becoming.” Worship, featuring a meaning of weorþ as honorable, joins this word with the suffix –scipe, as in “friendship.” So, worship originally is a condition of being worthy, shall we say, of worship. The misunderstanding–or “folkchange,” as Shipley more aptly calls is–understandable. Given its “currency” in Macbeth (OED), the association of weird with fate and concomitant mythology weakens, as what is most salient about the weird sisters is their odd, strange, and frightening nature. Interestingly, the OED gives other literary giants–Shelley and Keats–the citation for the shift from fateful to frightful. Shelley describes the unusual appearance of “weird clouds” in 1816 and a “weird cave,” suggestive of the supernatural, in 1817. In 1820, Keats writes of “weird syrops” to paint their oddness. Today, weird may not evoke “destiny,” but, aside from a general adjective for “strange” or “unusual,” whether of events or persons, it lives a fulfilling life, if my ears are any measure, as a go-to commentary that signals acknowledgement, much in the way of awesome, interesting, or crazy in their everyday contexts. Coworker: It turns out my mom is a third cousin of the creator of the game Monopoly. It’s really not that weird, but that’s not the point. One idea, expressed by a word, gets likened to another. We use it in a new way; we change it. We exaggerate, we overuse, we dilute. Though far away from its original meaning of “fate,” weird is no less powerful. It’s just different, a little weird, if you will. And I love this about the word. Interesting. I like “The Fateful Sisters” better than “The Fate Sisters.” Also, it occurred to me that “wer” must be the active element in “werewolf” (become-a-wolf), but my New Oxford American Dictionary says it’s from the OE “wer,” meaning “man” (“man-wolf”). Hmm. Yes, “The Fateful Sisters” has a better ring to it, if “The Fate Sisters” packs a bigger punch, if you will. Weirding ways, meaning, able to tell the future. It may be a southern thing, or an older English phrase seldom heard anymore. Excellent! I did not come across this in my research, but it does ring a bell, perhaps most from “Dune,” though. My initial queries aren’t turning up much outside of its usage there. Do you hear it/use it at all as part of a regional dialect or some such?